11.23 - World of Beer - Milford, CT. (Opus Lawrence & Rob Roy acoustic) w/ Ceschi - FREE! 12.09 - TBA (upstate NY.) - ? 12.10 - Water Street Music Hall, Rochester, NY. 12.11 - TBA (upstate NY.) - ? 12.18 - TBA (OH. &/or PA.) - ? 1.27 - The Tank American Legion Post 185, Agawam, MA. 2.08 - TBA (FL.) - ? 2.09 - Piper's Sports Bar and Grill, Greenacres, FL. 2.10 - Ashley's SportsPage Satellite Beach, FL. 2.11 - Haven Lounge, Winter Park, FL. 2.12 - TBA (FL.) - ? 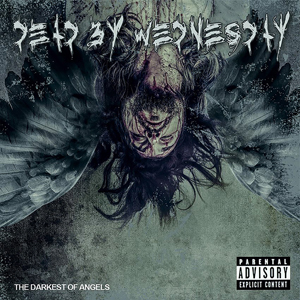 Just recently DEAD BY WEDNESDAY released “The Surgeon”, the new video directed by Jacques Molle’ from their guest vocalist album The Darkest Of Angels, via the EMP LABEL GROUP Facebook page, and you can watch it on KNAC.COM right HERE. The Darkest Of Angels features 11 tracks with 11 heavyweight guest vocalists including, Brian Fair (SHADOWS FALL), Waylon Reavis (A KILLER'S CONFESSION, ex-MUSHROOMHEAD), AK (FLOTSAM AND JETSAM), John Arch (FATES WARNING), Rob Dukes (FRAGILE MORTALS, ex-EXODUS), Carley Coma (CANDIRIA), Sean Danielsen (SMILE EMPTY SOUL), Paul Stoddard (DIECAST), Kris Keyes (formerly GARGANTUA SOUL), Antony Armageddon (ARMAGEDDON) and Ceschi Ramos (FAKE FOUR, INC.). Released in May via EMP LABEL GROUP/eOne, (and in August in Europe via Ellefson Music Productions/SPV) The Darkest Of Angels, (produced at Dexter’s Lab by Nick Bellmore), is a conceptual nod to DEAD BY WEDNESDAY’s previous longtime vocalist, who left the band amidst an ongoing battle with substance abuse. Instead of rushing into a replacement, the band, also featuring guitarist Joey Concepcion and bassist Mike Modeste, decided to create DOA, an entire album featuring tracks sang, and co-written, with guest vocalists, friends from prominent metal bands, each of who has had an impact on their lives. The result is an eclectic and emotional concept album showcasing the raw talent of DBW’s writing, combined with the unique style of each guest vocalist.